Everything becomes agitated. 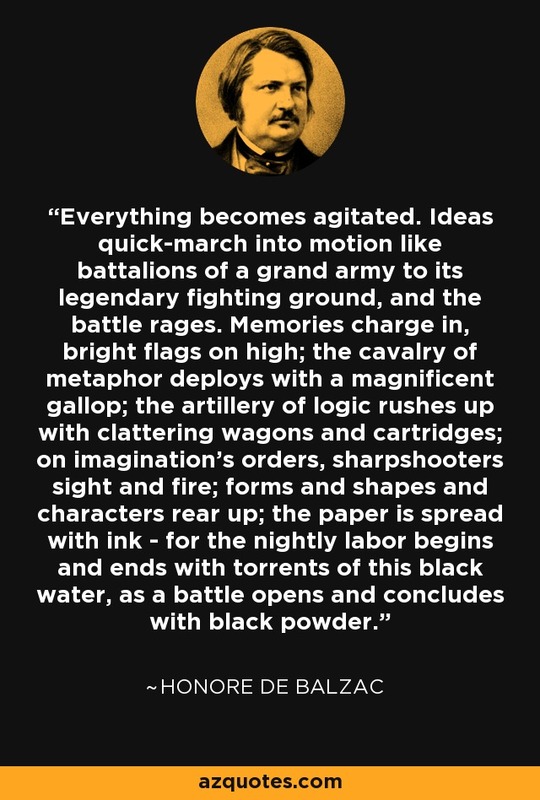 Ideas quick-march into motion like battalions of a grand army to its legendary fighting ground, and the battle rages. Memories charge in, bright flags on high; the cavalry of metaphor deploys with a magnificent gallop; the artillery of logic rushes up with clattering wagons and cartridges; on imagination's orders, sharpshooters sight and fire; forms and shapes and characters rear up; the paper is spread with ink - for the nightly labor begins and ends with torrents of this black water, as a battle opens and concludes with black powder.